About this time last year, the Florida Joint Center for Citizenship, as part of the Lou Frey Institute, was honored to be invited to attend and participate in the CivXNow discussion in Washington, DC with leading figures in Civics education. 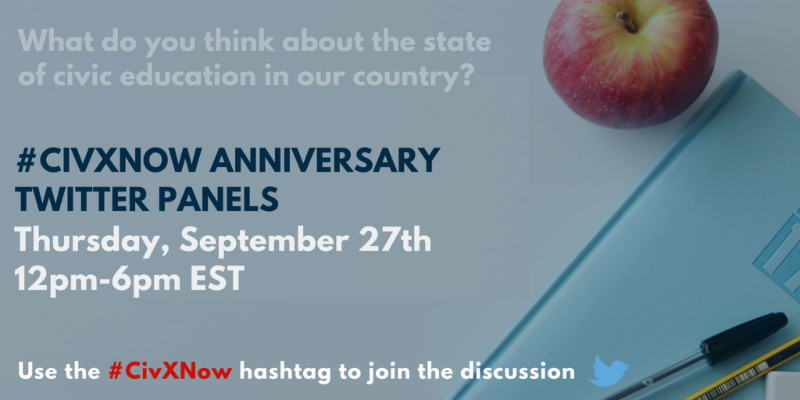 This Thursday, throughout the day, we will be participating in an online Twitter discussion about the state of civic education in the country today, and we encourage you to join us using #CivXNow, and feel free to @ us @FL_Citizen. And if you aren't able to join, please consider taking the pledge to dedicate yourself to improving civic education in the United States! Take the pledge if you believe every young person deserves to understand their rights and be equipped with the skills necessary to be informed and effectively engaged!